BASSETERRE, St. Kitts.--(BUSINESS WIRE)-- Ross University School of Veterinary Medicine (RUSVM) announced today the opening of its Research and Pathology Building to further enhance its research capabilities on St. Kitts, in the Caribbean, and globally. The 19,000 square-foot structure will facilitate multidisciplinary research collaborations and provide an academic platform for students and faculty to address pressing One Health issues — the interconnectivity of animal, human and environmental health. A grand opening ceremony took place on the campus and was attended by dignitaries from the St. Kitts government, leaders and Trustees of RUSVM, and executives from RUSVM parent company Adtalem Global Education, including president and CEO Lisa Wardell. The research building represents a USD $10.5 million investment in the educational programs at RUSVM. 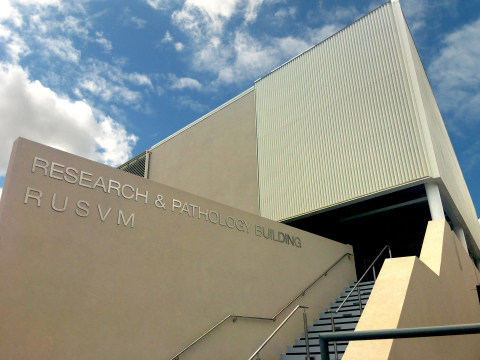 The building features 13,000 square feet of research space that includes eight laboratories, 2,000 square feet dedicated to pathology that includes necropsy and histology suites along with a viewing gallery to enhance student learning, and 4,000 square feet for small group meetings and student needs. The research and pathology sections of the building are designed to BSL-2 biosafety standards. “For the last 35 years, the island of St. Kitts has benefited from the presence of Ross University School of Veterinary Medicine, its contributions to the community and the health of our animals and ecosystems. We are pleased to see the continued investment in the island with this new research facility, and look forward to a continued mutually beneficial relationship,” said Timothy Harris, Prime Minister of St. Kitts and Nevis. Also during the opening ceremony, an additional portion of the new building, the Dr. Donald F. Smith Learning Center, was dedicated to RUSVM Trustee, Dr. Donald F. Smith, who passed away in 2016. An accomplished large animal surgeon, veterinary historian, writer and speaker, and former Dean of the Cornell University College of Veterinary Medicine, Dr. Smith’s book on the fiftieth anniversary of the Association of American Veterinary Medical Colleges, Pathways to Progress, was released to acclaim in 2016. Leaders of the Pack: Women and the Future of Veterinary Medicine co-authored with Julie Kumble, M.Ed. and released in 2017, explores key themes in leadership and highlights women in veterinary medicine whose stories embody those themes. His blog, “Veterinary Legacy,” chronicling the history of veterinary medicine is still widely read and maintained by Cornell University. Dr. Smith was a member of the American College of Veterinary Surgeons and a member of the National Academies of Practice. Dr. Smith’s wife and children were present as the building’s Learning Center was dedicated in his honor. His memory and commitment to leadership will live on with a plaque in his honor including his portrait and biography, displayed inside the learning center. 2 Institutionally reported enrollment data from Fall 2017.